Edmonton is a neat place for dining and I must say, I don’t mind dining in Edmonton! We went for breakfast bright and early at the Sugarbowl and it was already busy with a bit of the lineup outside their doors. We decided that we didn’t really want to wait for a table inside – so we sat outside! As we were outside on a breezy morning, I started with a nice cup of tea! The tea was quite unique as it wasn’t a brand I’ve seen before. It was quite fragrant but not overwhelming. I think it would have been nice with honey – I just put sugar in mine. This restaurant is known for their Cinnamon Buns so I ordered one and it was the size of my head! Although it doesn’t look very appealing, it was very fresh and soft and fluffy. It tasted really delicious with brown sugar topping and butter on the side. It’s like a fresh loaf of cinnamon bread but better! The other breakfast we ordered was their Chicken and Waffles and this was another great choice! The chicken was not greasy, well seasoned, and pan-fried to a nice tender crisp – and still super juicy! The waffles were light with a hint of sweetness. The maple butter was definitely a nice condiment and it completes the dish! This was one of my favourite breakfast places in Edmonton. Although parking can be a bit tricky, we’ve been lucky enough to find street parking and the weather was nice enough for us to walk to. The service was a bit lacking – but what lacks in that department really makes up in the quality of food! I’m sure this is a place I will return to! I first heard of Highlevel Diner on TV as I watched “You Gotta Eat Here”, and they were recommending their famous Cinnamon buns. So, we knew when we stayed overnight in Edmonton, this was a breakfast place on the top of our list. Nothing starts my day better than with some Hot Chocolate and so I ordered some here. It’s a nice treat to have hot chocolate in my diet as I love it, but often find it’s really sweet. I ordered their Farmers Omelette which was an amazing omelette with bacon, onion, potato, and cheddar cheese. It kind of reminds me of the items I love in my perogies! These items tastes amazing wrapped in eggs! Finally, the star of the show, the Cinnamon Bun where we ordered 1 to share. Thank goodness we did as they were the size of my head! It was soft, warm, fresh, gooey and not too sweet. It was the perfect cinnamon bun which needed nothing else with it. It was amazing! 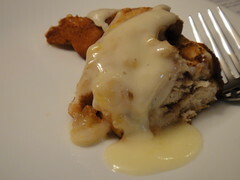 Overall, the cinnamon buns are to die for! 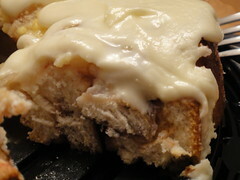 There’s a few other places on my “to go list” that include cinnamon buns now as it’s one of my favourite food items. I especially love cinnamon buns around Christmas time as it’s warming, inside and out! 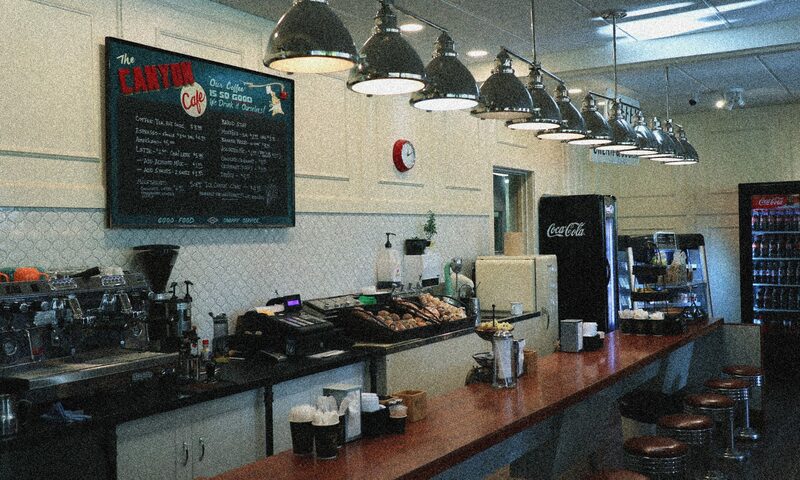 So, if you go to this diner, be sure to order yourself a cinnamon bun from here! Ah, anyone who knows me well, know I go insane for sweet stuff. I have a new love currently, and I don’t want to talk much about it… or they’ll be none for me. 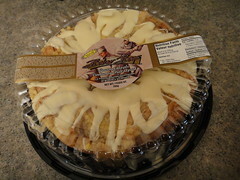 But, it’s from Baker Boys Bakery and they’re known as Apple Cinnamon Pull Apart. They are a fantastic treat to start my day with – for breakfast, and to end all my meals with!! I just cut up a little piece and pop it in the microwave for 10 seconds, and the warm icing melts and it becomes a dream come true! 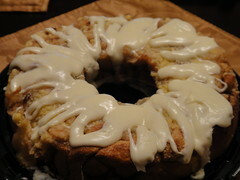 It’s got all the cinnamon bun goodness in little pull apart pieces, baked in a ring pan – or I would call it a halo! I’m not sure if it’s a good thing or bad as I munch on it through the day… and by the end of the day, I have no idea how much I’ve had. I think it’s a good thing, as it tastes wonderful! What I love most about this is the sweet apple chunks I get throughout, and it become warm and tender after I’ve microwaved it. It’s like a wonderful apple pie, but instead of a crust, it’s on cinnamon bun pieces! 🙂 I would recommend you go try it for yourself, but please leave some in the store for me!